State Finalists (From left to right) Harmony Gay, Apparel and Accessories Marketing Series; Kara Vohra, Marketing Communication Series; Hailey Snyder, Restaurant and Food Service Management Series; Trevor Minyo, Retail Merchandising Series; Shrey Mania, Hotel and Lodging Management Series; Connor Lane, Business Finance Series; Brittney Wilson, Hospitality Services Team Decision Making and Ashlynn Thevenot, Hospitality Services Team Decision Making. The Great Oaks Washington High School DECA Chapter after district competition. State winners Trevor Minyo and Hailey Snyder. Great Oaks Washington High School had a strong showing at the 2019 Ohio DECA Career Development Conference. 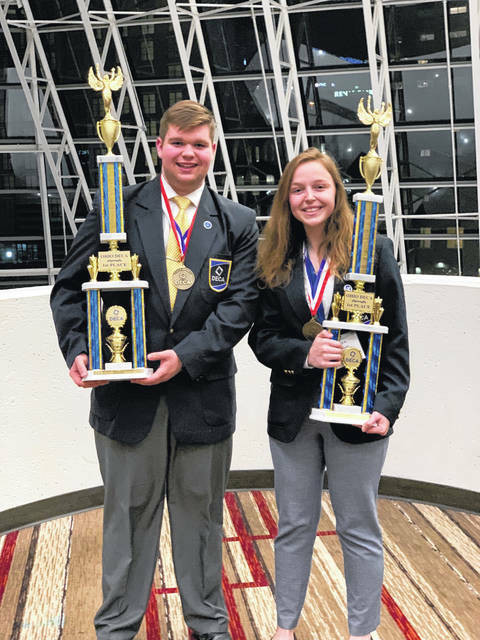 Local Great Oaks DECA students Hailey Snyder and Trevor Minyo returned home state champions. The chapter’s competitive season began in November when first-year students traveled to the Scarlet Oaks campus. There, these DECA members competed against other first-year DECA members. Senior Nick Bishop took home silver in the Sports and Entertainment Series event. The season continued in January when the chapter traveled to the Hyatt Regency in Columbus for district competition. Great Oaks Washington High School placed in every event they entered. Of the 41 students in the chapter, 30 qualified to advance to the state competition. 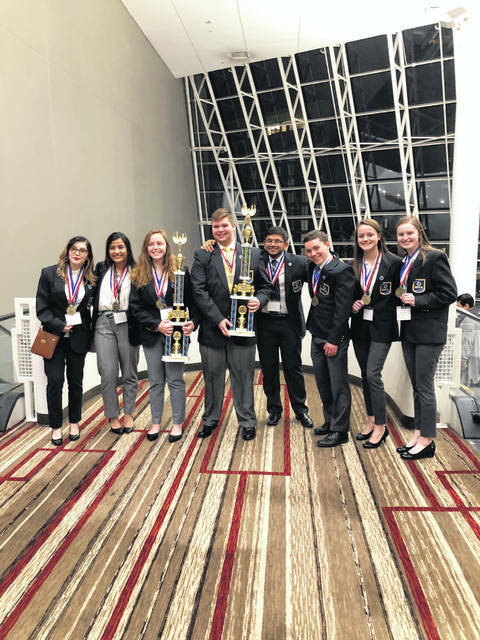 The 2019 Ohio DECA Career Development Conference was held on March 15 and 16 at the Greater Columbus Convention Center. Local DECA students competed against over 2,500 other DECA competitors. Kara Vohra, Shrey Mania, Trevor Minyo, Connor Lane, Harmony Gay, Hailey Snyder, and the team of Ashlynn Thevenot and Brittney Wilson qualified for finals. All eight members placed top 10 in the state, with Minyo and Snyder placing first. Snyder is a local senior and a two-year DECA member. Hailey plans to attend the Ohio State University this fall where she will major in accounting at the Fisher College of Business. She is an involved student participating in yearbook, student council, and senior caucus. Hailey is a member of the Lady Lions track team. Snyder won the Restaurant and Food Service Management Series event. Minyo is a junior and a three-year DECA member. He is no stranger to DECA, serving his second year as a member of the Great Oaks Washington HS DECA board. Minyo is a member of the band, a Blue Lion swimmer, and a member of the Blue Lion track team. Outside of school, Minyo enjoys participating in 4-H. This is Trevor’s third year placing at state and second year reaching the podium in the Retail Merchandising Series event. With their first-place finishes, Minyo and Snyder punched their tickets to the Sunshine State, qualifying for the national competition in Orlando, Fla.. The 2019 International Career Development Conference will be held April 27-30 at the Orange County Convention Center. The DECA chapter would like to thank Altrusa for their continued support of the Great Oaks and High School of Business programs. https://www.recordherald.com/wp-content/uploads/sites/27/2019/03/web1_IMG_9586-copy.jpgState Finalists (From left to right) Harmony Gay, Apparel and Accessories Marketing Series; Kara Vohra, Marketing Communication Series; Hailey Snyder, Restaurant and Food Service Management Series; Trevor Minyo, Retail Merchandising Series; Shrey Mania, Hotel and Lodging Management Series; Connor Lane, Business Finance Series; Brittney Wilson, Hospitality Services Team Decision Making and Ashlynn Thevenot, Hospitality Services Team Decision Making. https://www.recordherald.com/wp-content/uploads/sites/27/2019/03/web1_IMG_1581.jpgThe Great Oaks Washington High School DECA Chapter after district competition. 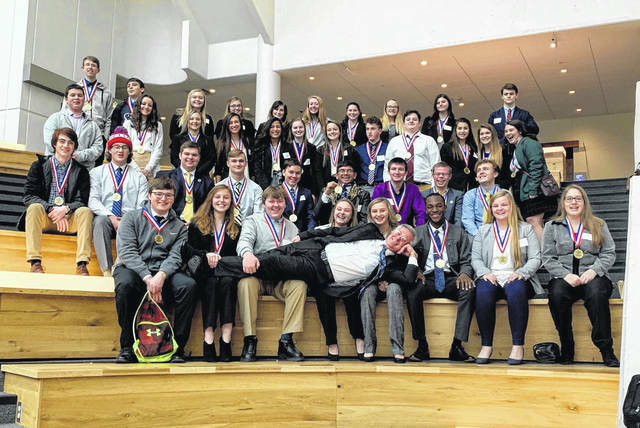 https://www.recordherald.com/wp-content/uploads/sites/27/2019/03/web1_IMG_1623-copy.jpgState winners Trevor Minyo and Hailey Snyder.